• Two Morning Activities (75-90 minutes each) which are chosen for a week at a time so campers can achieve continuity of teaching and goal focus. • Two Afternoon Activities (75 minutes each), signed up for daily at lunch so campers can be spontaneous depending on weather, energy, interest or what their friends are doing. 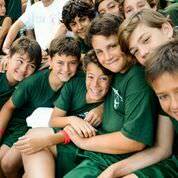 • Campers may also choose to sign up for a wide variety of activities or follow their activity passions in our Golf, Tennis, Soccer or Squash Academies, for example. • There are no age restrictions for any activities other than Scuba Certification (minimum age 12) and White Water Rafting (minimum age 11). • Since 1928, campers have been assigned to either the Green or Scarlet team and participate in a “color war.” This friendly rivalry tradition enhances community spirit. 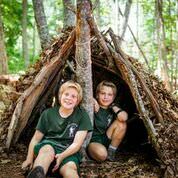 Green and Scarlet activities are oftentimes featured at campfire. Campfire Activities in the evenings create balance to the day-to-day program. These group-oriented activities include sports and “fun” games (like scavenger hunts), all-camp talent shows, all-camp debates, and all-camp dances every Friday night, just to name a few. We pride ourselves on attracting teenagers who have outgrown other camp programs. Advanced world-class instruction challenges older campers, and is oftentimes not found in other traditional camps. Robin Hood teenagers enjoy age appropriate and fun social lives, and do not feel treated like younger campers. • Age 14: Boys and Girls have a later bed time with lights out around 10 or 10:30 p.m. and have a more active and fun social life than younger campers. They enjoy co-ed movie nights, a beach party, cookouts, and trips out of camp without the younger campers. 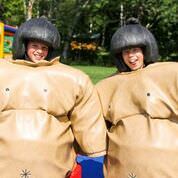 • Ages 15 & 16: Our unique Campers in Transition (CIT) program is our most fun, popular and challenging teen program. CITs are out of camp three to four nights a week for fun, private beach parties, movie nights, hikes in Acadia National Park and more advanced White Water rafting excursions. • NEW! Ages 15-17, July 7-28: For high school students looking to prepare themselves as best as they can for the challenging and confusing college admissions process to U.S. colleges, we are offering a 21-day College Bound Prep Program, providing intensive SAT/ACT standardized testing course, elite college counseling, and an expansive Five-Day College Tour of the Boston area, Connecticut, and New York City. Tuition for the 3 Week College Bound program is $7400, plus a $500 registration fee. Please email robinhood@robinhoodcamp.com to learn more about this exciting new opportunity. • NEW! Ages 15-18, July 7-18: We are pleased to announce an Learn to Ocean Sail Course and Cruise, with cruising among the hundreds of islands and harbors along the coast of Maine. Program highlights: Two weeks cruising aboard a 40’ sailboat sailing among the islands and Harbors of Penobscot Bay Maine; Learn to ocean sail or expand your sailing skills; Learn to navigate using charts and electronics; Learn seamanship; Earn an Ocean Sailing Level 1 Certification; Cruise Penobscot Bay to Camden, Stonington, Belfast, Rockland, Monhegan Island, Isle Au Haut, Swan’s Island, North Haven & Vinalhaven, Northeast Harbor, Bar Harbor; Optional PADI scuba certification course July 21-27. Tuition for the 2 Week Ocean Sailing Certification is $5500, plus a $500 registration fee. Tuition for optional 3rd Week PADI Scuba Certification course, plus access to Robin Hood sports and activities is an additional $1300. • The Junior Counselor (JC) program is by invitation only. Participants must have graduated from our CIT program and been selected. It is unusual to accept a first year 16 or 17-year-old camper who has not graduated from our CIT program but exceptional first year applicants will be considered. • The JC program is an intensive program that includes: hands-on training as both a cabin and interest counselor; First Aid, CPR and Basic Lifeguarding courses; and multiple seminars on safety, dealing with children, what it means to be a camp counselor, etc.